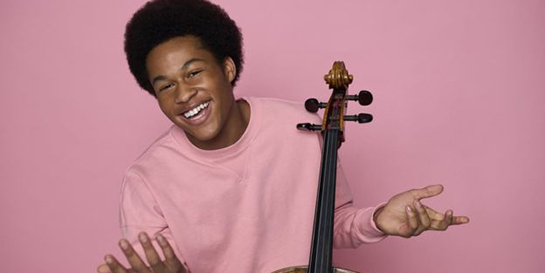 At 18-years old, Sheku – who was named Young Musician of the Year in 2016 - is also the youngest cellist ever to break into the albums Top 20. Finishing the week at number 18, Inspiration has also been a number two Amazon bestseller this week and remains at the top of the Classical chart. Throughout the week, Decca have been rolling out new social media content with #ShekuTop20 branding. Sheku has also been doing lots of promo, with an appearance on BBC Breakfast and interviews for BBC London, Manchester and 5 Live alongside press coverage in The Times, The Observer and Evening Standard. Last week, Decca launched the album in Sheku’s hometown of Nottingham. The label put together a jam-packed day, with performances as part of his old school’s assembly, the council building Loxley House, the Royal Concert Hall and the Paul Smith flagship store. He also gave a copy of the album to the Lord Mayor of Nottingham. On top of that, Decca arranged for the cellist to be transported around in one of the 60 Inspiration-decorated buses. Sheku is already finding fans outside his home country. His cover of No Woman, No Cry has featured on Spotify's Viral Charts in 21 global markets, including the US, Japan, Australia, France and Germany. Decca's Rachel Tregenza says, "We’ve not seen a new classical artist generate this reaction on a debut album before!" Sheku will be performing at the BAFTA awards on February 18th, making him the only artist to do so two years in a row. BAFTA were so impressed by his rendition of Leonard Cohen’s Halleluiah at last year’s ceremony, that they’ve invited him back.